Recently I spent a day at Lady Anne Funerals in West Ryde, behind the scenes observing how they operate. I first met a few Lady Anne staff at the Rookwood open day. They were quite open to the idea of me going to observe and study their operations. Rare considering the paranoia and secrecy in most of the funeral industry. This is about my day inside Lady Anne Funerals, what I saw and what it was like. I had a great day and learnt a lot. Lady Anne Funerals is a wonderful company with great staff. Most funeral homes are secretive and paranoid about their operations. From numbers to practices they avoid giving the details to those outside the company. However I found Lady Anne Funerals to be refreshingly open and up front. Surprisingly my only restriction was to not take photos of the deceased. Which wasn't an issue as I tend to avoid photos of people (living or dead) on this blog. Other than that I could take photos of what I wanted, talk with who I wanted and ask anything. Essentially were no restrictions on me or my study of Lady Anne. The Lady Anne Funerals building is impossible to miss. It is on a good spot on Victoria Rd, West Ryde and solid purple. The whole building from top to bottom is purple with white accents. Even without any signs it is obvious who owns the building. Lady Anne has done a good job of spreading the purple and butterfly imagery around the area. It is quite a striking purple to, almost Cadbury Purple and quite vivid. Upon entering the building I was confronted with purple and butterflies. It was surprising to see so much purple, so many butterflies. But then I realised that it was not 'confronting', it was not overbearing or overdone. Oddly enough it worked, the purple and butterflies were really quite tasteful and well done. The boss/owner came out to greet me. She took me through to the office, which is adjacent the reception area. We briefly discussed my intentions. Obviously she was interested, but not worried or concerned. She didn't really mind what I was there to study or why. As far as she was concerned the funeral home was open to me, regardless of my intent. Lady Anne is one of the few funeral homes to manage its google page. Many funeral homes are reluctant to have a webpage. Lady Anne takes this one step further and has managed their google page. Which is how my friends and I find and evaluate businesses, including funeral homes. If a company does not manage its online presence then the internet will take it over. This is why some funeral comes, cemeteries and crematoriums get unfairly negative reviews and comments. It is not just 'young' people on the internet. A friend high in the nursing home system said how one of the first questions is about the internet connection. Many older people and their families are asking the nursing homes how fast the internet is. I talk a lot about InvoCare, so I thought it only appropriate to study and discuss one of their competitors. An alternative to the InvoCare model. Lady Anne has always been particularly interesting as they are a new company, and operate in direct competition to White Lady Funerals, InvoCare's flagship brand. Lady Anne is a small to mid range funeral home. Doing a little over 200SpY (Services/funerals per Year) and growing. For my definitions I define a mid range funeral home as doing about 300SpY, so Lady Anne just falls into this category. What is surprising about this is Lady Anne was founded in 2005. Less than a decade old and already doing over 200SpY and still growing. An impressive growth spurt for a young funeral company. Many other funeral homes have been around and established for decades or even centuries. Anyone who knows Lady Anne knows they have a thing for butterflies. Every single room (except the chapel) had at least one butterfly tucked away somewhere. The main areas like the office and reception room had the most butterflies. 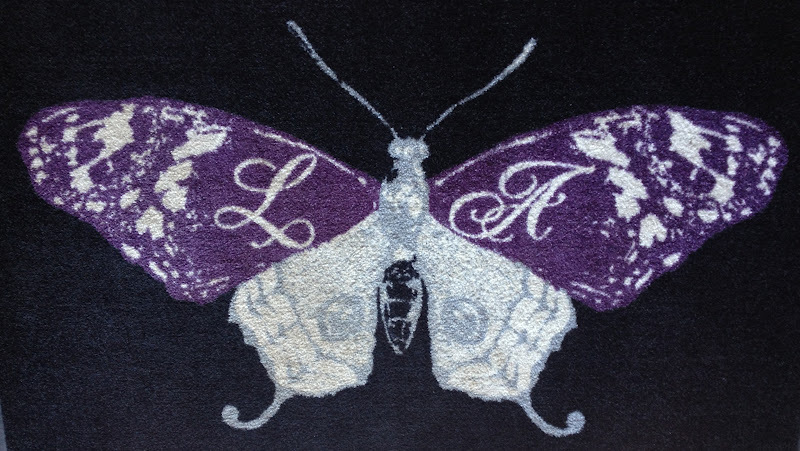 Large mat with butterfly print. The PR person told me how they used butterflies because of the symbolism. That the butterfly represents change, which is how they saw the death. Not as a loss or an end but a change. I won't get into the symbolism and such of butterflies, it is famous and probably exists in every culture. Then the PR person joked, rhetorically exclaiming "who doesn't like butterflies". Which is fairly true, butterflies are fairly popular. It is a non-offensive and emotional symbol for a company. No doubt it stands out from the other funeral home logos. Most funeral homes use something a little plainer and simpler. Like a flame, a leaf, a swirl and so on. The butterfly is a stark contrast to these logos. Even the bundy clock where staff sign in/out has a butterfly. nobody forgot to sign in/out. Lady Anne do not give out the run sheet on the day of the funeral. Rather they are emailed to staff in advance and printed at home (if needed). It was difficult to find when exactly the run sheet is emailed out, some said it could be sent the night before the funeral, others said it was sent a few days in advance. I suspect it is sent when it is ready. Either way this is a great idea, it lets staff know the details and prepare before the day of the funeral. The run sheet is also one page per funeral. At WNBull they would have all the funerals on the one sheet. But at Lady Anne each funeral has its own sheet. This allows them to give a decent amount of detail on each funeral, and to still have space on the sheet so it is not crowded or messy. Perhaps the most surprising part of my time at Lady Anne was the loyalty of the staff. The staff retention rate was fairly high, many had been there 6 or 7 years, from around the time the company started. Only a few had been there for less than 3 years. There was no indication the staff were unhappy, or wanted to leave. Clearly things were not always perfect, but even at the worst I suspect most staff wouldn't consider leaving. The boss and staff put the high retention rate down to the fact that everyone is happy where they are. That nobody wants the other's job. Another reason given is that they are selective about who they hire. However from what I saw this was not the whole story. Some staff actually did want more, want to move up or over. Perhaps they did not want this strongly, but the desire was still there. Rather I would put this down more to loyalty, as in getting along and how much they like the company. I found something strange about the loyalty. It was confusing who or what the staff were loyal to. There was a loyalty to the company, that is clear. The staff talked of doing a good job for the company, promoting the company, preserving the company image and so on. There was obviously loyalty for the company and pride in what was done. In talking about their loyalty, their pride and so on many staff would have difficulty separating the boss and the company. It was almost as though they were confused about who they were more loyal to. As though the boss was Lady Anne Funerals. More interestingly is that this only occurred when the boss was not around. When the boss was there staff were clear who they were loyal to, either the boss or the company or maybe both. There was no confusion or doubt. But once the boss was gone they were loyal to both the boss and the company simultaneously and unable to separate the two. It was odd and interesting how the boss has essentially become the company to the staff. It demonstrates how we define and identify something can become very grey and tangled with other things. The staff were also happy with each other. They commented on being a good crew and joked about each other with one another. This is not to say everything is always wonderful at Lady Anne. I did get a sense that things were not always the best, that sometimes there were disputes or people were unhappy. But overall everyone was friendly and had no doubts about working at Lady Anne and it was a friendly atmosphere. The staff were all very friendly. When they first arrived some were slightly surprised to see me. But none appeared uncomfortable, even when they found out I was there to watch and record them. It was also obvious that the boss had not warned anyone that I would be there. All but a handful of the staff work on a casual basis. Lady Anne does not have the work to support a large crew of full-tim staff, so it gets them in as needed. A few people commented on how it can be hard to find enough people sometimes. That on a few occasions many of the casuals are busy and have other commitments. I asked if they employed students. After all, there is a TAFE nearby and students tend to be cheap and have spare time here and there. But I was told that they tend to avoid 'young people' as older women were "more sensitive". This is an unfortunately common assumption in the funeral industry. That younger people might not be 'suitable' for the work or 'unreliable'. I have been contacted recently by a couple of different young people in the industry who face this assumption regularly. One was even told he would never conduct until after he was 30. He ended up leaving the company. Lady Anne is not ageist, it is not actively prejudice against younger people. But it does suffer from this assumption on some level. Having said all this their mortician is only 27, which is young for the industry. The staff share roles quite heavily at Lady Anne. Some have specific roles, such as PR or mortuary work which is not shared too much. But the main roles of arranging and attending funerals is shared. I asked a few staff who "the conductor" was. Everyone gave a different answer, there was no set conductor or arranger as everyone did it as needed. Role boundaries were blurred as staff did a bit of everything. This in turn created a better understanding of how the business worked. Staff knew a bit about everything, so there was less confusion. They all knew how a funeral worked, how to arrange and so on. It also meant staff needed to interact more, so communication was great. Everyone knew what the other was up to and if they needed help. Because of the heightened formal communication there was also a string friendly banter. Cross training is generally a good idea, Lady Anne is just a perfect example of how when done right it greatly improves things. While I was there the postwoman came around to drop some mail off. The Lady Anne staff greeted her by her first name. They all had a very friendly chat as she discussed some wrongly delivered mail. There was obviously a long-term and very friendly relationship between them. Later when the mechanical trolley had an issue the boss had her son come over to fix it. Between this and the friendly banter with the postwoman it was clear that Lady Anne has a solid foundation in the community. I decided to do a little bit of informal research about the presence of Lady Anne in the area. To see if they really did have a place in the community. I went to Top Ryde Shopping Center and asked a few people if they had heard of Lady Anne Funerals, and if they had what they thought. Well over half had heard of it, and many could even say where it was located. Few had an opinion about it, they just knew of it rather than about it. Several of them commuted past the building regularly, stating how it was hard to miss. The few who did have an opinion were very positive. I should note that this was not really an accurate 'study' as I only asked a handful of people while there. A more in-depth study might get different results. Yet it supports my theory that Lady Anne Funerals has a strong and positive place in the local community. Most funeral homes are into community work. As a form of promotion and justification, something I want to talk more about in the future. Lady Anne is no exception, they sponsor a lift at Concord Hospital and are organising a campaign with the RMS called "leave the phone alone". This campaign is aimed at highlighting the dangers of texting and driving. One of the staff was killed by a driver who was texting. The person organising the campaign told me how "everyone lost" in the accident. The family had lost a wife and mother, the company had lost and employee and the staff had lost a friend. Also that the driver had gone to prison and lost his freedom and his family had lost him. So they wanted to give something back, to get something positive out of the event. This was amusing to me as I had suggested a similar idea for WNBull or InvoCare in 2011. That the funeral home work with the RTA to do a safe driving campaign. But my idea was rejected as it was not 'appropriate' for a funeral home. Not an issue, but fast forward a year and Lady Anne are doing the same thing and getting a positive reaction. It is a great reminder how different funeral homes view things very differently. The new Lady Anne was looking at alternative community events. While the older WNBull was sticking to the tried and true community events. The staff also showed me a few customer surveys that had just come back. The boss told me how they get a 90% return rate for their surveys. Which is very high, normally getting respondents for anything is difficult. The psychology department at universities 'encourages' psych students to do the studies. At UNSW 8% of the first year psych students grade is dependent upon them participating in studies. Getting respondents is difficult, unless there is money or something else involved. For this reason and for cost reasons most social scientists limit surveys to about 1,000 people. My social research methods textbook (by Bryman, a great social scientist) explains that while this number is a generalisation it will give an accurate image of the larger population regardless of how many people are in that population. So to get a 90% return rate is quite impressive to me. What they find is that the majority of those who voluntarily respond are extreme, either very positive or very negative. Because they have to want to respond, and those who want to are motivated because they are either very happy or very unhappy. This remained true for Lady Anne as almost all surveys came back with very positive reviews. The 'worst' thing I saw was that someone gave "average" for the condition of the premises. Yet this surprised the staff as the person had not been to the funeral home, the funeral was only at a crematorium. So perhaps this referred more to the crematorium than the funeral home. Many are surprised to discover that Lady Anne only has one hearse. Despite doing 5 (or more) funerals in a single day they operate with just one hearse. The boss did say that on occasion they hire a second hearse if needed, but they only own one. Interestingly the hearse is 3 years old. There were no dents or noticeable pain swirls on the bodywork so it looks newer than it is. I noticed that the back numberplate was rather scratched and damaged. The boss said it was from when a car ran into the back of the hearse and did a fair amount of damage. Appart from the numberplate the rest of the hearse was in prefect order. The boss said she was usually the one to clean it. Clearly she did a good job. I found a great sense of pride for the hearse, the boss and other staff said that it was "our pride and joy". It was not just a car, it was a symbol, a badge that embodied the company. They took pride in the company and so they took pride in the hearse. Happily and proudly showing it off to me. As they showed me the hearse it felt more like they were eagerly boasting rather than describing. It was a great example of how a hearse comes to represent and display the company. From looking at a hearse one can get a sense for the funeral home. There are more photos of the Lady Anne hearse in this post about the Rookwood open day. In addition to the hearse Lady Anne hase one mourning car, but they can hire more if needed. They also hire a limo that matches the hearse for select funerals. Although second to the hearse the staff are obviously proud of the mourning car. It might not represent their business as well as the hearse, but it is still something they show off. Lady Anne use a white Ford station-wagon as their transfer car (seen below). It only has one stretcher which means only one transfer can be done at a time. I suspect they would rely on transfer companies like Statewide to help with transfers at busy times. There were several Statewide magnets and other promotional things scattered about, which fitted my theory. The staff called the transfer car "the ambulance". Which is strange and amusing. A lot of the funeral industry terminology mirrors medical terminology, deliberately. Yet it always aims to make a clear distinction and separation. Especially from calling the transfer car an ambulance. Most of the Lady Anne staff have not worked at other funeral companies, so they have not picked up these habits. The windows are tinted so one cannot see in the back. Lady Anne is a very safe and nice place. Oddly OH&S is a high priority, as is the employee comfort. Many smaller funeral homes can cut corners with regards to OH&S, preferring to use common sense than pay for equipment or alter procedures. This was not the case at Lady Anne. I noticed they had a mechanical trolley, for moving the coffins and bodies. When asked about it the boss said how it made it easier for staff, and safer. She spoke first about comfort, then about safety but never about cost. She also told me how they prefer 'drop down' handles on the coffins. Because these handles, while a little more expensive are much more comfortable to carry than the fixed handles. She even joked about how these handles would prevent the staff from breaking a nail. The mechanical trolley is just next to the yellow bin. In front of the fridge door. The boss talked of staff comfort, then OH&S and never about trying to justify the cost. To her the cost and the item was a necessity, and not an optional extra. It was also present in little things, like issuing gloves for staff to wear when carrying the coffin. The boss would often say "safety for women" in regards to OH&S. But also with regards to security. I had noticed that there was a good security presence, not just motion sensors but also cameras in all the main areas. In the office and out the back at the 'lunch' table were monitors which showed the cameras. These were used to see if someone was in the reception area, but could also be used after hours to see if there was an intruder. When I asked the boss about this she said it was for staff safety. How after hours there was sometimes one person working back late to finish things up (which was usually the boss). That this person would need to be safe. Lady Anne is not scared of technology, in the coffin display room sits a server quietly buzzing away. They use a VOIP system for the phones, and have a removable desktop hard drive system that only my most computer savvy friends have. The Segate GoFlex HD has a special little doc that the hard drive can slot into while sitting on the desk. Most people just get a USB drive (like me) and connect it directly to the computer or to the router (like me). Instead Lady Anne have connected their drive to the VOIP system, which is more complex but a better setup. While I was there this drive had some connection issues, the boss immediately went chasing wires to see if it was plugged in properly. She had already tried the 'turn it off and on again' trick. Clearly technology was not something this funeral home or boss was scared of. They understood and embraced technology. The server at Lady Anne. The standards of the funeral home were also impressive. Every now and then the staff would randomly clean up, putting something away, wiping the table down. They all did little things constantly to keep the place clean, and I suspect they never really noticed. They just did it without thinking. Obviously a lot of care and pride is put into the place by the boss and staff. The boss showed me a pot of paint she had at the side, telling me how she intended to touch up the paint on the building when she got time. The place was in good order, not because the place was new but because it was looked after. Something that struck me was when the boss and staff were talking about some photos for a funeral. They were concerned with getting the 'right' picture that properly represented the personality of the deceased. They were spending their time and money to find and fix a picture to show who the deceased was. It was nice to see, that they actually cared about the mourners and deceased. It was also interesting that Lady Anne does much or the printing and editing themselves. Most funeral homes tend to contract out the printing to printers. But not at Lady Anne, to keep costs down and control the quality they designed and printed the order of service themselves. The mortuary is located out the back, next to the hearse and transfer car. Next to the mortuary is a staff area with clothes, a table to eat and work at, supplies and so on. The funeral home and hearse were very clean, spotless really. It was obvious they put a lot of pride and dedication into what they did. So I expected the mortuary to be decent. Having said that this is a small funeral home, with just one hearse. So I didn't expect the mortuary to be too fancy either. Just that it would be decent, good enough. Instead it was amazing, on par with InvoCare in terms of quality and spotless. InvoCare mortuaries are very good in most cases. They are always clean, but they tend to have dents and scuff marks scattered about. Indicators of how busy they are and the pure volume of work done at InvoCare. The Lady Anne mortuary was possibly the best I have seen. Everything was clean, not just clean but cared for. I looked everywhere for signs of damage or dirt. Even the inside of the drains were perfectly clean. The only 'bad' spot I could find were some very minor rust marks on a vent in the corner. Even these were just superficial marks. This is what a mortuary should be. let people know if someone is locked inside. can be opened from the inside even if it is locked. Everything inside the mortuary met and exceeded the laws as far as I could tell. InvoCare is the only other funeral company to meet every law (that I know of) regarding the mortuary. The boss told me how much trouble it had been to build a mortuary. Something I have heard others say, that the council and locals tend to worry about 'contamination' when looking over funeral home permits. Someone once told me it is so difficult and expensive to build a new funeral home in a residential or commercial area that many go to industrial areas. It is nice to see a funeral company fight back, to get into a residential/commercial area and out of the factory zone. I was allowed to watch the resident mortician prepare bodies. Here I discovered why the mortuary is so perfect. She would disinfect and wipe everything down after using it. Obviously this was not just done because I was watching, it was just how she operated. The mortician would always wipe down the tray after taking the body off, even letting the disinfectant sit for a few minutes to do its job properly. After picking up some tools from the table she wiped it down, removing any water spots. It was also interesting how quickly and effectively she worked. While I was there she prepped and dressed a body, then finished dressing two more and coffined all three. All in under 2 hours. When she prepped a body she would do everything, wash it down, disinfect it, break the rigor mortise, shave any untidy facial hair, suture the mouth, clean the mouth and nose, and more. She did all this completely by herself, I offered to help but she had such a rhythm that I would just slow things down. It was interesting how she used the weight of the body to get it to basically move itself. There was no effort in what she did. Even coffining a body, her technique meant it would roll into the coffin on its own. Without any machinery or help she did the lot. An old looking embalming machine. As we were talking she said how an embalmer had once told her it should take 40minutes to prep and dress a body. She said how this was a bit unreasonable, after all she was on her own and not that experience. I didn't have the heart to tell her that while chatting to me she had completely prepped and dressed a body in just under 30minutes on her own. A foot pedal on the bin so no touching is needed. This is the same type of bin hospitals use. The resident embalmer is only 27, relatively young for the funeral industry. Her first (and so far only) funeral industry job is at Lady Anne in this role. She was great to talk with, passionate, fun and quick. It was interesting to watch how quickly she worked. A few times she was so focused on the work and chatting to me that she forgot I was there. Suddenly moving the arm or leg of the deceased and nearly clipping me. She just got into the momentum of it. Indicating how the job had become an automated process for her, like tying ones shoes. It was now something she could do without thinking. Further more her demeanour and mannerisms changed slightly as she entered the mortuary role. I noted that she got more energetic, her range of movement was extended and she appeared happier and relaxed. She was stepping into her role, her job. She took pride in her work because her work represented her. It is hard to draw too many conclusions from one short encounter, but it wouldn't be surprising to find that being a mortician was a big part of her identity. The dirtiest thing in the whole mortuary. A coffin display room is relatively common in the funeral industry. The coffin is where the funeral home will make the most profit. It is the equivalent of wine in restaurants. High profit margins so it can cover other necessary costs. Thus it makes sense to devote a whole room to displaying coffins. Although many funeral homes do not have a coffin display room most do. The display room at Lady Anne is rather small, but has a good range and layout. It is a goor representation of the type of coffins they have. There was also a board with different types of handles, so one could see and feel the various options. Lady Anne use Key Industries coffins. Key Industries is a coffin manufacture in Wetherill Park with a large variety of coffins on offer. Lady Anne does not store coffins at the funeral home, rather coffins are delivered as required. The boss told me how Key Industries would deliver within 24 hours, even on public holidays. This meant she did not have to buy and store a surplus of coffins. She could just order one or two as needed. Saving the company both space and money. The coffins are stored on a slight angle, so one can see the side and lid at the same time. The coffin below looks like an Italian Sarino coffin. With the ring on the lid and the carving on the side. It is also very similar to the coffin Elite Funerals was showing off on the Rookwood open day. Closeup of the carving down the side. Below is an alternative lid for the black and white coffin. To show how one can swap lids about to create whole new and custom styles. Lady Anne have an oversize LifeArt coffin (pictured below). This is the only oversize LifeArt I have ever seen. Most are hesitant to use oversize LifeArt coffins as they are made of cardboard. Both the mourners and funeral home worry about the coffin breaking, although I doubt this would happen. Coffins arrive at Lady Anne trimmed and almost ready to use. Final touches, like a crucifix and thumbscrews are put on by the staff outside the mortuary. Three coffins, being prepared by the mortuary. Almost all funeral homes will have a small chapel somewhere. It is just one of the many services they provide as mourners expect it. lady Anne has a small chapel by the reception area. The chapel itself is small, seating about 20 people. But the chapel is connected to the arranging room by a partition. This partition can be opened up, making the chapel able to seat 48 plus room for another 20 to stand. In total the chapel can hold about 70 people if needed. Projector screen at the front of the chapel. The chapel itself has an AudioVisual system, with projector and speakers. This makes it possible to play videos, music or pictures as needed. The arranging room is connected to the office, but by opening a partition it opens up into the chapel to. At the back of the arranging room are two cabinets which display various things for the family to look at. From urns to crosses they show items to help mourners decide what they want. The back area and office were surprisingly small. Yet they got a surprising amount of work done and had a lot stored there. I also noticed in the back area and throughout the rest of the place everything was a high quality. For example most places have a non-name vacuum. Lady Anne have two expensive Dyson vacuums. Everything was high quality, down to the vacuum. The boss said how she paid more for decent things as they would last longer and do a better job. The Dyson vacuums might be expensive now, but should last years and work very well. The office, small but busy. The uniforms are all washed regularly, once a month or more. Often funeral homes will hold off washing uniforms as it is expensive. At WNBull our uniforms were dry-cleaned once every 6 months. I was there for about a year and had my uniform cleaned 3 times. Lady Anne will wash many parts of the uniform themselves. These parts are delicate and they do not want to risk a dry-cleaner damaging them. It also saves the company money as they can do the washing themselves at the office. This is where the hearse is kept and cleaned. There is room to park about 5 vehicles (including the hearse) on the premises. Bellow is a small door used to move coffins from the garage area to the display room. There is very little manual handeling required at Lady Anne. These are some of the storage areas for the uniforms. Lady Anne have a few different types of uniform and are always updating. Lady Anne hand out little bottles of water and packets of tissues, like all funeral homes. But they also hand out little individually sealed mints. A nice idea as I found mourners would need something a little more than water. Of course all this is given out at no extra cost. Just one of the default services Lady Anne provide on all funerals. Lady Anne Funerals was the most open funeral home that I have interacted with so far. They were more than happy for me to come and see how they worked. Telling me the details from numbers to procedures. For many funeral homes these would be coveted secrets, but not at Lady Anne Funerals. It is the most open and up-front funeral company I have dealt with so far. This is also one of the best funeral homes that I have seen or heard of. Not only do they do an impressive amount of business with very little. But they also do the job extremely well. The back area meets and exceeds the regulations and everything is at a very high standard. Lady Anne is a top quality funeral home, and the staff are proud of their work and happy to talk about it. If someone wanted to observe a funeral home this be my first recommendation. It's a great example of what a funeral home should be and can be. It's also a very open place, new to the industry and so not use to the secrecy and paranoia that many funeral homes experience. That does look a lot more lively than I thought, no pun intended. I have the strangest feeling that I'm going to work in a funeral home when I'm older, so I thought I'd read up more about it. I'm not the most serious person either, which was odd to me, but this helps to ease that concern a bit. I don't think it would be too bad to work in a funeral home. This is really the other side of funeral homes. I found this very interesting and intriguing. I have fun reading the post even if its long.